RS007 | This is Augusta Marx (b. 4 April 1854; d. 25 January 1920). This is likely an engagement picture from the early 1870s. 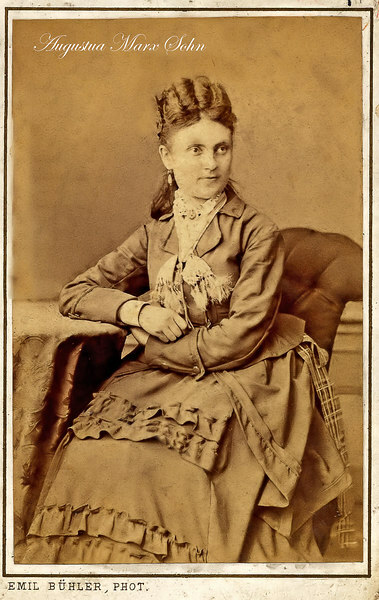 She married Samuel Sohn (b.15 June 1848; d. 12 Feb 1927). They would have six children survive to adulthood: Leo (to marry Fanny Loeb of NY), Gustav, Rosa (to marry Leopold Rothschild 1900), Hugo (to marry Bertel, one daughter, Ann [Hartwich], Ernestine (to marry Solomon Lehmann 1900, one son, Herbert), Ernst.